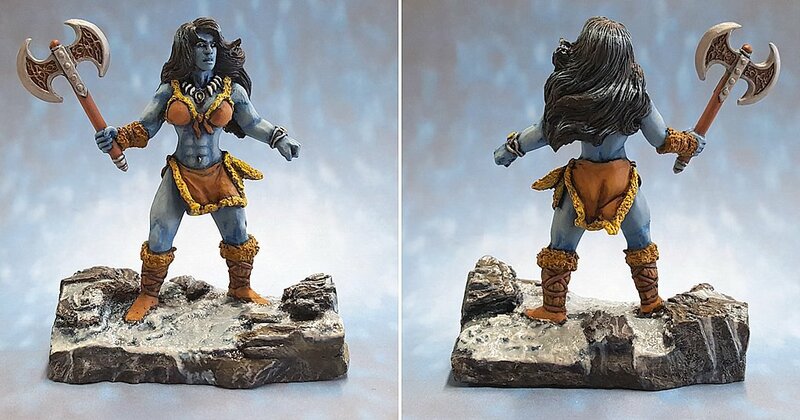 Frulla Krung was chosen as the next project by popular vote on the Reaper Miniatures forums. The miniature was sculpted by Sandra Garrity and the base was composed of a piece of slate, sand, ballast, and bark. You can see for yourself in the WIP post. 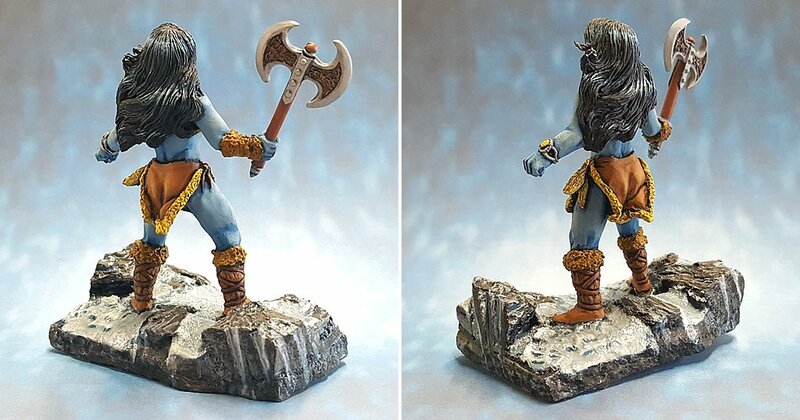 The miniature is depicted as a frost giant so I gave her blue skin and instead of a classic blond look as most seem to get, I decided to keep hers dark blue. For the eyes I went with a bright grey iris to make them creepy, intense and stand out. She’s clothed in the latest fashion of yellow fur trimming a classic leather bikini top and loincloth bottom. Her “Ugg” boots are wrapped with leather thongs and she likes a fur bracer. She’s sporting a tribal necklace of teeth but with a pendant to match the bracelet on her arm. Her other accessory? The family battleaxe. A classic double headed axe with some amazing filigree work on the flat of the head. She’ll claim a few heads with it next go around with the humans below. Her ancestral home is high within the mountains and thus covered in snow, ice and hoarfrost. Reaper Sample Color “Horizon Blue” (Highlight), Reaper Ashen Blue (Basecolor), and Reaper Dragon Blue (Shadow) with Reaper Midnight Black as the liner. 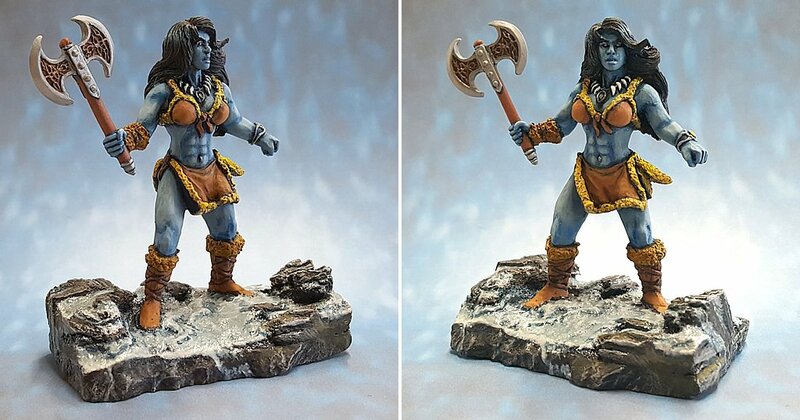 Here she is … Frulla Krung, the Frost Giantess!